Madison Roller Derby can trace its pedigree all the way to the birthplace of flat track roller derby in Austin, Texas. League co-founder Crackerjack had her first exposure to the game after visiting her sister in 2004. Back in Madison, CJ and co-founder Pam Demonium convened a meeting of like-minded women at the Wisco on Willy Street and what was then called the Mad Rollin’ Dolls was born. The league began skating and training at Fast Forward Skate Center. Our first exhibition bout was in November 2004, and the first official bout of the debut home season was held two months later. MRD was the fifth flat track league to form in the world, and became one of the founding members of the Women’s Flat Track Derby Association (WFTDA), a democratic governing body that sets standardized rules and codes of conduct, and provides sanctioning for games and tournaments, for the over 600 member leagues worldwide. What began as a throwback to the kitschy older days of derby quickly evolved into the highly athletic, competitive, but still campy and fun sport you see today. We also outgrew the space at Fast Forward for games and moved to our current bouting venue at the Alliant Energy Center. In addition to our commitment to building this incredible sport right here in Madison and worldwide, and to entertaining and engaging our fans new and old, MRD is about service to our community. In 2016 we made the official transition into a non-profit, 501(c)3 organization to better align with our mission of charitable outreach and community engagement. In 2018 we officially changed our name to Madison Roller Derby as part of a move to more fully support our league expansion to include a wider and more diverse membership. The league itself is made up of over 100 volunteer skaters, referees, non-skating officials, and support staff. We have four home teams made up of 20 skaters each plus bench support. The rivalries are friendly but very real, and there’s pride in winning the seasonal championship and “Leggy,” the storied trophy. The MRD all-star team, the Dairyland Dolls, have represented the league on the international level since the beginning. We hosted the WFTDA Eastern Regional tournament in 2008, the International D1 WFTDA Playoffs in 2016, and began our own WFTDA-recognized invitational tournament, Udder Chaos, in 2018. In 2013, the DDs added a B Team to their ranks to continue to train the up-and-coming Madison roller derby all-stars. Team Unicorn has existed as MRD’s open-to-all travel team since 2009, and holds the distinction of playing in MRD’s first ever international game in Hamilton, Ontario. They have continued to tour internationally, adding Dublin and Paris to their derby passport. With thousands of skaters and support staff the world over, roller derby has seen exponential growth over the years. The sport and its community foster teamwork and self-improvement for all involved. We recognize that our success is due to the support of friends, families, sponsors, and, most importantly, all of you--our fans. Madison Roller Derby practices and competes on Ho-Chunk land, a place their nation has called Teejop (Day-JOPE) since time immemorial. In an 1832 treaty, the Ho-Chunk were forced to cede this territory. Decades of ethnic cleansing followed when both the state and federal government repeatedly, but unsuccessfully, sought to forcibly remove the Ho-Chunk from Wisconsin. This history of colonization informs our shared future of collaboration and community building. Today, Madison Roller Derby respects the inherent sovereignty of the Ho-Chunk Nation, along with the eleven other First Nations of Wisconsin. Please take a moment to consider the many legacies of violence, displacement, migration and settlement that bring us together here today. And please join us in uncovering such truths every day. Madison Roller Derby, Madison’s premier roller derby league, first laced up its skates for the public in late 2004 and began its first full season in 2005. Since then, the dynamic skaters and dedicated volunteers have been providing a sport that not only features pure athleticism but a punch of serious fun for its many fans. MRD is a grassroots effort run by an all-volunteer group of skaters and non-skaters. These derby enthusiasts are behind everything from practices and bouts to merchandise and community involvement. MRD is considered a “grandmother” league within the Women’s Flat Track Derby Association, having been one of the first five leagues formed when the modern version of the sport and the WFTDA first formed. As of 2016 we are officially a 501(c)(3) non-profit organization, with a focus not only on producing high quality sporting events but also on charitable and community outreach, as well as educational opportunities for our league members. It is the mission of Madison Roller Derby, Inc. to provide a safe, inclusionary space to foster the development of a competitive women’s flat track roller derby athletic program, build leadership skills through volunteer opportunities, and make a positive impact in our community by serving as role models for our peers and future generations. MRD, pursuant to its mission of promoting women’s roller derby, does not and will not discriminate on the basis of race, color, religion (creed), gender expression, age, national origin (ancestry), disability, marital status, sexual orientation, or military status, in any of its activities or operations. MRD does not and will not differentiate between members who identify as female and those who identify as a non-binary gender (including but not limited to genderqueer, transmasculine, transfeminine, and agender) and does not and will not set minimum standards of femininity for its membership or interfere with the privacy of its members for the purposes of league eligibility. These activities include, but are not limited to, draft/home team skater eligibility, membership eligibility, disbursement of resources, and eligibility for office. MRD is committed to providing an inclusive and welcoming environment for all skaters, officials, volunteers, and fans. The Women’s Flat Track Derby Association (wftda.com) is a national sports organization created and managed by all-female flat track roller derby leagues. Founded in 2004 to help the country’s first leagues connect with each other on and off the track, WFTDA has become the nucleus of roller derby evolution. By standardizing rules and regulating interleague play, the organization fosters the continued growth of the sport and provides leagues with support and guidance. WFTDA maintains league rankings and organizes annual tournaments for the most skilled teams. We have so many amazing people who have contributed to the league since its inception, and we’re always working on ways to better recognize, appreciate, and support MRD alumni! If you are a former league member, please consider signing up for our new MRD alumni newsletter. We’ll send you occasional league updates, special deals on tickets and season passes, interviews and other fun tidbits with/about alumni, and more. 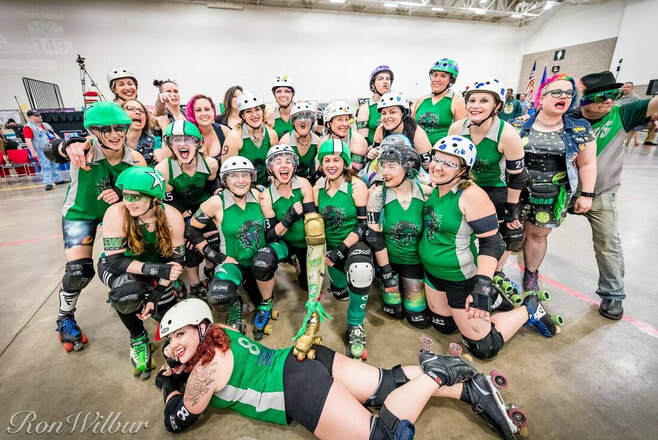 Madison Roller Derby (formerly known as Mad Rollin' Dolls) is comprised of several teams. Under the umbrella of MRD we have our recreation league, our home teams, our all-star travel team, and our new juniors league. Mad Calves Junior Derby is our newest addition to the MRD family. Junior Derby is open to skaters ages 8-17 and is for all genders. Visit the Mad Calves page for more! Madison Wreckers Roller Derby is the adult recreation league. You can learn all you need to know about skating and playing roller derby by joining. There are multiple skill levels, making it a home for everyone 18 and older. Check out the Wreckers page for more information. Our 4 home teams (Quad Squad, Reservoir Dolls, Unholy Rollers, and Vaudeville Vixens) are made up of skaters ages 18+ who have prior experience with roller derby. They have got through training, a skills assessment, and a draft process to be placed on a home team. They learn to play derby though Wreckers or other leagues. The Dairyland Dolls is our all-star travel team. Skaters here are current or former home team skaters that have gone through additional training and a more extensive tryout process. The DDs are ranked in the top 40 of all WFTDA (our governing body, like the NBA) leagues in the world! In addition to skaters we also have our extensive family of support and officials! A huge thank you to all those who help make our game days a success!!! Madison Roller Derby keeps rolling because of our incredible crew of dedicated volunteers. Among other things, they take the tickets, lay the track, and produce the bouts we all love. Volunteers are the lifeblood of our league. Madison Roller Derby is always looking for help and there are lots of ways to get involved, regardless of whether or not you ever want to strap wheels to your feet. ​Our awesome volunteers are at every game, usually wearing orange (or stripes), and are great people to talk to about what they do and how to get involved, too. Or check out the UDO 608 section for more information about United Derby Officials Local 608, our stellar crew of skating and non-skating officials (also on Facebook). Non-Skating Officials (NSOs) – jam timers, penalty box managers, stats trackers, etc. ​Watch this space for opportunities to train with us in Summer 2019! A: Yes, anyone can try out as long as you are 18 years or older and female or non-binary identified. If you are between the ages of 18-21, our recreational team, Wreckers Madison Roller Derby (MWD), accepts skaters aged 18 or older. Rec sessions start at various times throughout the year. For more information, hit up Wreckers Leadership. Q: What if I can’t pass my WFTDA minimums or don’t even know what those are? A: We are not looking for a 100% pass on WFTDA mins to get into the draft pool (WFTDA mins can be found here). We will be assessing these skills at tryouts, but first and foremost we’re looking at safety on skates and ability to be trained. We are looking to take a group of skaters into the draft pool that we feel have potential to learn and be game-ready by the beginning of MRD’s home season. Q: HOW MANY SKATERS DO YOU DRAFT EACH YEAR? ​A: The number of skaters drafted varies every season based on home team needs and number of open roster spots at the time of the draft in October. A great time to ask about expected number of spots is when teams host their meet-and-greets during the draft month. ​A: No, but you will need to sign a waiver for tryouts. If you are accepted into the draft pool, you will need to purchase WFTDA insurance. Contact us to get on our mailing list and be notified about future training opportunities. ​Tryouts for Madison Roller Derby is open to adults aged 18 years or older and female or non-binary identified. If you are male identified and would like to play the game, we recommend contacting the awesome Mad Men Roller Derby. Click here if you're interested in becoming a skating or non-skating official and we’ll put you in touch with the officiating crew. All genders are welcome and we will teach you everything you need to know to officiate this sport. A game (or bout) consists of two 30-minute periods with episodes of play known as JAMS. Five skaters for each team – one JAMMER and four BLOCKERS (including the PIVOT) – move counterclockwise around the track in a formation called a PACK. Jams last for up to two minutes each, but can be ended sooner by the LEAD JAMMER. The pack is the largest group of Blockers from both teams within 10 feet of each other. Blockers in the pack act offensively to help their own Jammers score points and defensively to stop the opposing Jammer from scoring. The Pivot is the lead Blocker, identified by a stripe on their helmet cover. The pack determines where the action is. You must be within 20 feet of the pack to block an opponent or help another member of your team. If players get too spread out, there is No Pack and they can’t block or assist other players until the pack re-forms. If skaters do hit or assist when there is no pack, they are Out of Play and can be penalized. Jammers wear helmet covers with stars and line up behind the pack. Their job is to score points for their team. The first Jammer to get through the pack legally earns Lead Jammer status, giving them the ability to call off the jam by placing their hands on their hips repeatedly. Starting with their second trip though the pack, the Jammer scores a point for each opponent they pass legally. The Jammer also earns points for any opponents in the penalty box after they pass their first opponent on the track. While Blockers always serve 30 seconds for each penalty they incur, that’s not always the case with Jammers. To keep the action moving, a Jammer will serve a shorter penalty if the opposing Jammer goes to the penalty box before a minute is up. When this occurs, the first Jammer gets released and the second Jammer serves the same amount of time as the first. ​Blocker highlights the body parts you can use to block with: torso, booty, thighs, and upper arms/shoulders (but not the elbows). ​Target shows the areas of the body a skater can deliver a block to. Note that Target’s back is not one of them. Roller derby has more referees per player than any other sport. Pack Referees skate with the pack to ensure legal play and are found on both the inside and outside of the track. Each Jammer has their own Jammer Referee who skates on the inside of the track to count points and penalties. Knocking an opponent down legally is fun! Knocking someone down illegally results in a penalty. Major Penalties are given for illegal blocks that knock an opponent down or out of bounds or get a player around more than one opponent. This results in an immediate trip to the penalty box to serve a 30 second penalty. ​Hitting or pushing an opponent in the back is Back Blocking. Sometimes an opposing player will counter-block with their booty. If they hit their opponent first, it’s a counter-block, not a back block. Forearm penalties are given for use of hands or forearms to block or push opponents. Elbow penalties are given for making any contact with an opponent using an elbow. Illegal Procedures are technical penalties that don’t impact any specific opponent. Too many skaters on the track, false starts, a Jammer who is not the Lead Jammer successfully calling off the jam, or leaving the penalty box early are a few examples. Also, when returning to play from the penalty box, you must enter behind the pack. Entering ahead of any skaters in the pack is an Illegal Procedure. Low Blocks are contact on or below the knee that cause an opponent to stumble or fall. But looks can be deceiving; if you back block someone and then trip over them, it’s your fault (and your penalty), not a low block. Sometimes feet just get tangled up in the course of normal skating and no penalty is awarded for this accidental contact. Cutting the Track penalties are called on a skater when they re-enter ahead of the player who knocked them out of bounds, or when they pass other skaters while one of their skates is out of bounds. If the skater who knocked you out of bounds goes out of bounds or falls down, you can re-enter ahead of them, but you still have to be careful not to pass other skaters. Passing only one opponent, or two or more teammates, is a penalty. You can push and pull your team-mates, but can’t hold hands and block with them. Multi-Player Blocking is called when holding on to a teammate prevents an opponent from getting past. Use your head, but not for blocking! … or for Blocking TO the Head (aka High Blocking) as an initial target. Picture this…. it’s 2005 and MRD is closing in on the first ever home season championship. You need something to give to the winners as a trophy. What do you do??? Well… here is the story of our championship trophy, Leggy. From Tatum Tantrum (MRD alum): “I found her (a mannequin) in an alley behind a row of shops in Long Beach is 2001. I named her Japhy after the character Japhy Ryder in Jack Kerouac’s Dharma Bums. She traveled with me back to Chicago and then to Madison. She stood in my front window of my apartment on Johnson Street until one day she fell over and her head cracked in half, as well as a broken arm. As we were trying to figure out what to do for a trophy, I decided then that she was ready to make that sacrifice for our league. So that way, she could live on forever. I propped her up in my living room and with ski goggles on and a bandana over my nose and mouth, I began to saw her leg off. My roommate was very confused when he walked into the apartment to see my hacking at Japhys leg with ski goggles on. Haha!